Our First Step Program is set up to meet the individual needs of our infants and toddlers. Our infant room teachers follow the individual schedules set by you, the parent/guardian. Although all caregivers will be involved with each child, a primary caregiver will be responsible for your child's daily needs. Each staff member has received specific training and updated inservice on an infant's physical, emotional,and other developmental needs. 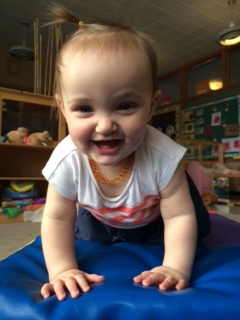 Activities are pre-planned to enhance sensory, cognitive, social, motor, and communication development. Another piece we feel is very important is parent communication and involvement. No one knows his or her child better than a parent. We also know it is going to be hard for you to leave your babies in someone else’s care. We want you to feel comfortable calling us as often as you would like throughout the day and if there is anything we feel just can’t wait until pick up we will call you. We send notes home daily telling you the child's eating, sleeping and diaper change schedule. In addition to daily verbal exchange, caregivers will provide you with a daily written report of activities and special moments of your child's day. This daily report includes your child's eating, sleeping and diaper change schedule as well as any activities we have done with them during the day. It is important for us to be partners as we care for your children. We have an open door policy and if you would like to stop in and visit we would love to have you. This will allow you to meet the sunshine and caterpillar room teachers along with the chance to observe our preschool programs. If you have any questions please give us a call.